El tour es completo para ver y vivir la cultura Maya. Tuvimos problemas al inicio en la recogida del hotel, pero finalmente nos embarcamos. El sitio de los Xenotes fue espectacular, la visita al pueblo Maya y el Shaman de lo mejor, pero el almuerzo se demoró mucho y no tuvimos suficiente tiempo en Chichen Itzá, que era el atractivo principal, cuando llegamos nadie nos comunicó que el parque se cerraba a las 4:30, de haber sabido esto, tal vez hubiéramos hecho las cosas al revés. El viaje es muy largo y el tiempo en las ubicaciones es muy corto. El animador del viaje por parte deTranslamex fue malísimo, muchos malos comentarios y y chistes fuera de lugar. Contraté El servicio plus que contiene bebidas ilimitadas y en el autobús casi no se apareció el joven que nos pasaba las bebidas, En general no se aprovechaba el servicio por el que se pagó. I enjoyed the full day adventure. We got the plus tour which I was glad because it provided us with breakfast. The tour guides were very knowledgeable. I think the time at Chichen could be shortened so that we have more time at the Cenote. (We only had 45 min at the Cenote) it went incredibly fast since we still had to change and 'shower' before going in the water. The last stop was also very rushed - it was 20 minutes, which I think it should be at least 30min. But overall enjoyed it. The only down was the waiter had drinks for us in the cooler- and he carried stuff that wasn't included like bottled iced tea so it was annoying when he lays out the ice chest for us to grab from and then having to put back our teas because it 'wasnt' included in the plus tour. Last thing- the bus was tight. If the people in front decide to recline their seats, good luck to your legs. The experience was worth it in the end, glad I took on this full day excursion. Expect a full day trip, but well worth it. Our tour guide, Jesus Cuevas, was easy to understand, knowledgeable, and had a great sense of humor; very accommodating. Bus was as comfortable as it could be.We chose the basic package. The stop in Valladolid wasn't nearly enough time to look around, but we were on a schedule. Everything else was great. The lunch buffet had great options. Tacos were delicious! Even though it rained, it was an awesome experience! The tour guides were excellent and very knowledgeable. The only thing I didn’t like about the tour was that the main tour guy kept talking about tips. I know what I need to do and I don’t like to be reminded. Valladolid was only 15 minutes. I wanted to see more of Valladolid. It was a very rushed visit. Main tour guide pushes the gift shop near Chi Chen Itza and it is expensive. The Selva Maya Cenote is breathtaking! Julio kept the refreshments coming! He was awesome on the trip. A few highlights and tips and issues. The stop at Valladolid is 15 minutes. That is enough time to walk in the church and come back out. So walk fast! The bus ride was freezing cold. My husband and I and the two guys sitting by us were freezing.The cenote was awesome and beautiful. You must pay 1.00 to get life jackets which are mandatory. The changing facilities and bathrooms were very clean. Watch out because they are going to try to sell you everything on this tour. The lunch was really good but I was charged for my drinks. Dont know why! Be careful about buying too much at the lunch site. We spent all our money there and didn't have any money left to buy things at Chichen itza. We were told we would be at Chichen itza for 1 hour and 45 minutes. The first part was a guided educational part and the second part was supposed to be where we could walk around independently. I dont know if we got there late but 15 minutes into us being able to walk around independently they were Closing the park!! All in all very educational, very cool, but bring some money! This is a third party retailer and GO MEXICO is the one who actually operates the tour. We only had two hours at the site, one hour with a guide and one on our own, which is really not enough time. On the way we stopped at an area that had one big shop that offered all kinds of items to buy and was also our bathroom stop. All prices are fixed so no haggling. 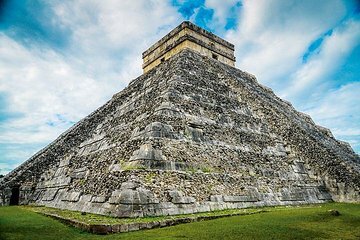 My advice, wait until you get to Chichen Itza as you will find all the same things there with so many individual vendors on site that will negotiate...MUCH CHEAPER! One of my biggest issues was that even though I booked the English tour, our tour bus was bilingual. The tour guide would go back an forth from Spanish to English and I felt I lost so much information about the history of Chichen Itza. The site was so amazing and I was so disappointed at the lack of information we received, but at least when we arrived we were broken up into an English group and a Spanish group. The experience was nice, this was our first time seeing a pyramid in person. However, the whole ride there was horrible! way too long and so many stops. I would suggest next time rent your own car and drive there this was you are not stuck in the middle of nowhere. This was a great tour. Hector was a great tour guide for Chichen Itza. He was so informative and answered all of my questions. The tour bus was modern with comfortable seating. The hosts and drivers were excellent and made the trip very relaxing for the long drive to a from Cancun. We had no problems whatsoever and I would most definitely recommend Transalamex. The tour is all day event lasting 12 to 14 hours but it is well worth it.